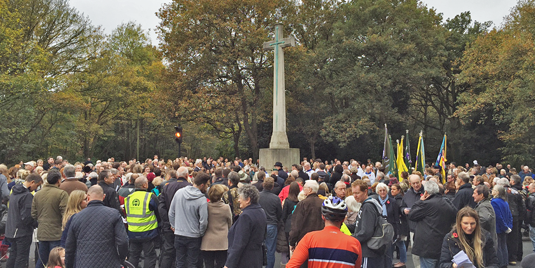 “This year there is a new name on our War Memorial: Thomas de Quincey. His name was engraved last month and is the first addition since those added after the Second World War. He was a 2nd lieutenant in the Rifle Brigade, killed in 1915. His name was not engraved when the Memorial was built because for years his mother refused to accept that he was dead. His name was inscribed on the Ploegsteert Memorial in Belgium, his family being unable to intervene in that case. The reasons for his mother’s refusal are not clear, but her determination speaks of the pain brought about by war – pain on the field of battle and pain for those at home – physical pain and mental pain. 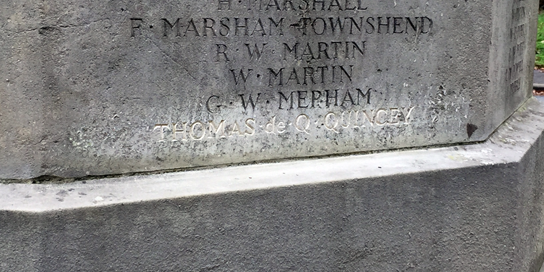 Thomas Edmund De Quincey Quincey was the eldest son of Richard de Quincey Quincey and of Ruth de Quincey his wife, of Inglewood, Chislehurst Kent. He entered the School in 1907 and left in 1912, when he proceeded to Pembroke College, Cambridge. He was trained in the Officers Training Corps of the University, received his Commission in November, 1914, and went to the Front to the 2nd Battalion The Rifle Brigade in March, 1915. Seven weeks after his arrival in France he went into action on Aubers Ridge, near Fromelles, when he was reported “Wounded and Missing”. Later he was assumed to have been killed there on May 9th, 1915. Age 21.